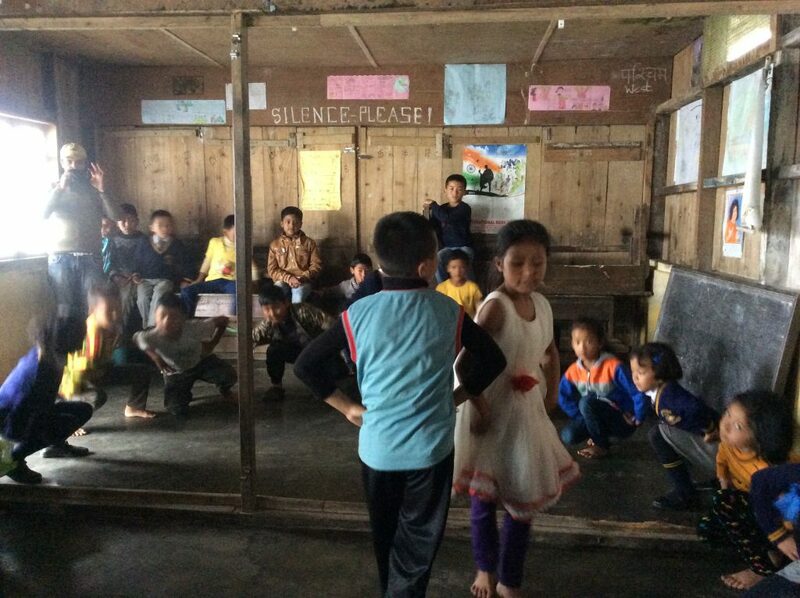 Ruth, one of our trustees, visited our projects in Kalimpong with the aim of working with the local teachers to help improve standards of education and engagement. Here, Ruth tells us about her trips around the local schools. If you’ve missed it, catch up on Part 1 of her blog here! The next 2 nights are spent in Santa’s home with his wife and young daughter. The village hasn’t long had electricity and is peaceful and calm. We learn about the allotment scheme Santa is promoting, for villagers to grow crops to sell in order to fund their children’s education. Severe weather prevented its success last year, but he is trying again. The village school is tiny and the headteacher sleeps in a room upstairs. His office is opposite – he slept here when he hosted Mondo volunteers so that they could have his room; such is the value that schools here place on volunteers working with them. The rains that night are fierce; we’re still in monsoon season and it’s a “good monsoon” this year. But the bumpy, unpaved mountain roads are now treacherous and our driver has let us down. We set out in a borrowed car, Santa at the wheel. The journey is interrupted many times by landslides, road works and a fallen tree. But everyone is so patient and the obstacles moved without hurry or grumbles. 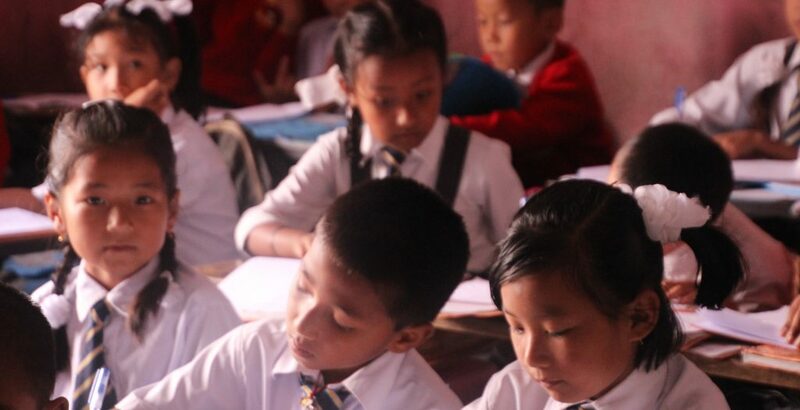 At Step-by- Step, we find children learning out on the verandah with flimsy partitions splitting rooms, trying to make room for all the children who want to learn. Many of their mothers work on the tea plantations we’ve driven through, others walk a much longer distance each day for school. 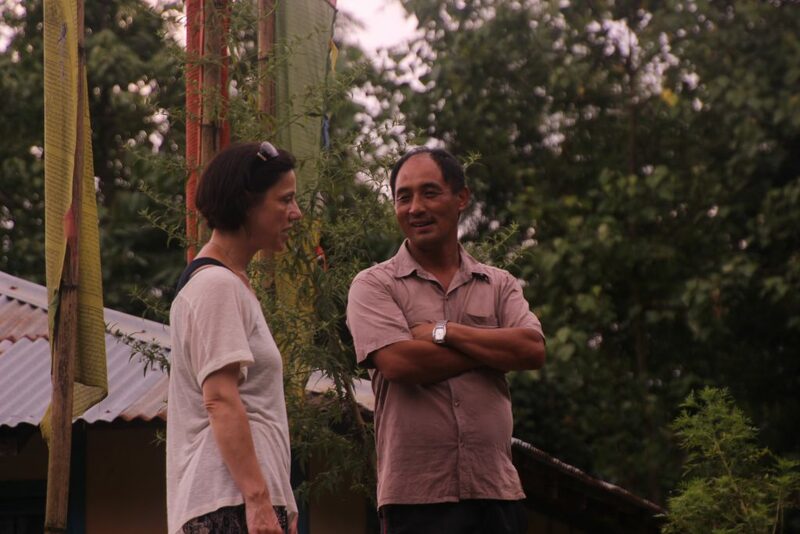 The head welcomes us with tea and biscuits; he would love to expand his school so that everyone fits more comfortably and we wonder what it will be like in the winter when it’s really cold – there’s very little protection from the elements. Returning up the mountain, we reach Lava Primary School, hidden in the mist. Over lunch we talk with the head and deputy about key issues for the school and find they are very similar to those I face with my own school – children’s ability to speak English well, pupil numbers and funding, finding high quality teachers. The phonics here is made harder by poor pronunciation; we agree I will ask my phonics specialist teacher to create a CD that might support this. We have a swift walk around the school, stopping to watch a dance being prepared for the Independence Day, but needed to head off as there was a long drive home and the weather was coming in. The journey was tough for Santa; poor road conditions made ever worse by the rain. The children who go to school here often walk long distances, carrying the most enormous, heavy bags. Books don’t get left at school, but are taken home to complete homework – exercise and text books for most subjects. The schools we visit over the next 2 days are of similar condition and we hear the same stories from the headteachers. Buildings are quite basic, playgrounds/yards are often uneven, muddy and just empty spaces. 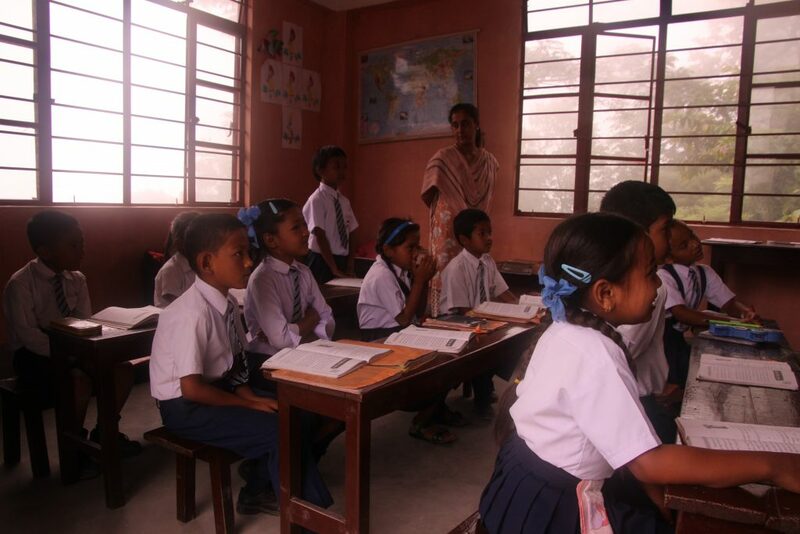 Toilets are few and often without water, classrooms contain just desks and chairs, with a chalkboard and maybe some posters or work on the walls. We hear lovely tales of keen teachers, great achievements by the pupils and witness polite, hard-working, eager children. However, we also hear about the government schools – where corrupt systems allow many teachers to be registered at schools with hardly any pupils; where false numbers of lunches and books can be claimed for. Our Mondo schools are funded privately, have to offer lower salaries (meaning the teachers are often unqualified) and have fewer sources of help. Yet they provide a higher standard of education and the children leave better prepared for the next stage of their learning. Despite being private schools, not all pupils actually pay, but they are allowed to continue coming as headteachers don’t want to turn any child away. We are over-awed when we witness lunchtime at RIBS, near the Nepal border; every child has a lunch brought to him/her from home and the mothers wait in the playground for the children to finish before taking their tiffin boxes home again. The commitment to education is palpable and I can’t help pondering on the apathy we often experience at home towards the schools our families take for granted. We spend the weekend on our own in Darjeeling, enjoying the tea plantations and walking on the mountains. It’s an important weekend in India, for Independence Day on Monday – hoards of children are getting ready for “march-by”, dance competitions and fun and games. We’ve seen even the youngest children dance each step perfectly without the intervention of teachers that we’d expect to see at home (not that I didn’t spot at least one little boy being cheeky in the back row, which I found a little reassuring! ).